Sunday, September 6, 1914: The whole family spent the day down at Aunt Lizzie’s. Ruth and I went down on the trolley. I took my camera along and had a shot at the crowd in the afternoon. Walked out from town this evening. Felt that I was benefited by my jaunt for I had eaten too many good things for dinner. What a fun Sunday! It sounds like an almost perfect day. Aunt Lizzie was a sister of Grandma’s father, Albert Muffly and a previous diary entry indicated that she lived at Montandon. I’m not sure who she married. Montandon is located about 8 miles southeast of the Muffly farm. I’m amazed at all the transportation options that were available in a fairly rural area a hundred years ago. Back then there was a trolley that ran from Watsontown to Lewisburg with stops at several intermediate locations including Milton and Montandon. Apparently Grandma and her sister Ruth walked a mile and a half or so from their farm near McEwensville to Watsontown, and then boarded the trolley. Probably the rest of the family traveled via horse and buggy. Posted on September 6, 2014 September 5, 2014 by SherylPosted in OtherTagged family history, genealogy. Previous Previous post: Hundred-year-old Advice: What Should I Feed My Family? Looks like the trip to Niagara Falls may have fostered Grandma’s interest in photography. She sure seems to enjoy photography. And, probably the Brownie camera that she bought prior to the Niagara Falls trip makes it easier for her to take pictures. I love the idea of them taking a trolley! So do I. It sounds like it would be so much fun. Back then there was even an amusement park called Riverside Park located between Watsontown and Milton that had a trolley stop. Sounds like a fun day for Grandma and her family! It does sound like a really relaxing, fun day. I’m surprised how part of the family went via trolley–and the rest apparently went using a horse and buggy. Helena really seems to thrive on outings. This is so vibrant again! I agree! She does seem so happy. An easy trip. Jump on the interstate. The postcard seems to be colorized. Any idea of the date? Unfortunately I don’t. The postcard is at the Milton Historical Society. A few years ago I visited their offices and took a photo of this card. Your question sent me back to my notes from the visit–and I don’t have any details about this card. But it does make me realize how important it is to take good notes. We lived an hour west of Chicago during the 80s. Our town was on a major road to the city. One day while cleaning out some garage junk, I reached up on top of a board at the inside wall. A piece of paper came down. It was a tri-folded brochure for the 1933 Chicago World’s Fair in excellent condition. I took it to the local historical society. They’d never seen one before. My dad and his brother went to the fair that summer just before dan and mom married. Wow, it’s amazing how you found it, and that it was in such good condition. She really seems to be enjoying the Brownie camera that she bought prior to the Niagara Falls trip. You may have tried this before, but searching for Elizabeth or Lizzie [no last name] born about 1865, in Penn., in West Chillisquaque (where Montandon is located), might give you some surnames you could explore to try to figure out who she married. Thanks for the suggestion. I really need to do that. 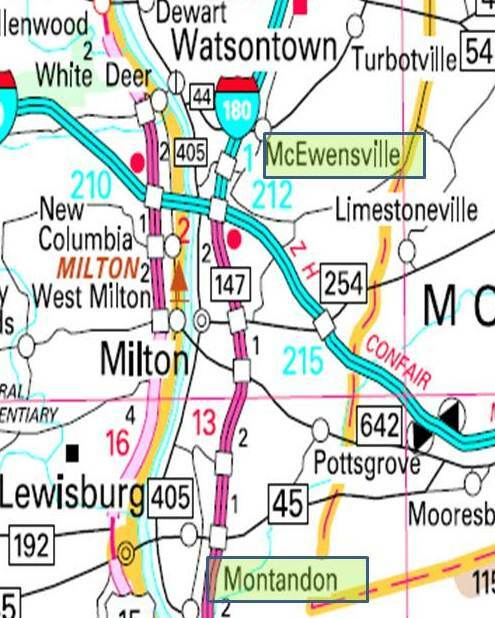 I just realized when I was working on this post and looking for a map that had Montandon on it, that Montandon is not an incorporated town/borough; and that information about it is, as you said, generally listed under West Chillisquaque township. I was surprised because, though it is small, it seems larger than some of the other towns that are incorporated. A lovely way to spend the day indeed! It sounds like it was a perfect Sunday. “Felt that I was benefited by my jaunt for I had eaten too many good things for dinner.” I love this. If only more teenagers felt this way today. Helena is really enjoying her photography. I agree! I wonder if it made her feel like she had a role as the family photographer at gatherings like this one. What a nice day she had! Loved the picture of the trolley. The picture of the trolley makes the town look so picturesque. Great to get so many words from her — and fun. I understand Ford paid for the removal of the trolley system from towns — good for the car business. Not so good for mass transportation. And I like her sense of humor too in referring to the amount she ate. Interesting–and a little sad. I think that I read somewhere that the trolleys that ran between these towns ended trolley service sometime during the 1920s because of decreasing ridership. It’s neat that she made a comment about the benefits of walking. Working off dinner! I love the days she’s chatty. 🙂 She seemed to enjoy her camera. A Photo that Grandma Took! The photo of them at Niagra is so interesting …. A moment captured! I love the hats! I was just thinking to ask the same question that Jane asked – have the photos survived and have you ever seen them? Is another family member the keeper of the photos? Thank for the link. I must have missed the entry (I was away). Isn’t it a little surreal that your Grandma mentioned this photo differently than others she took and it may be the only one to survive 100 years? How many of us express what we thought after we took a photo about the photo? I also found it amazing. I think the fact that Grandma really liked the photo from the get-go contributed to its survival across the years. I agree. It was saved because of her love of the trip and the photo she took. I didn’t think of it that way. A trolley ride and a good jaunt along with taking photos sounds like a fun day. I agree! It sounds like a lovely way to spend the day. 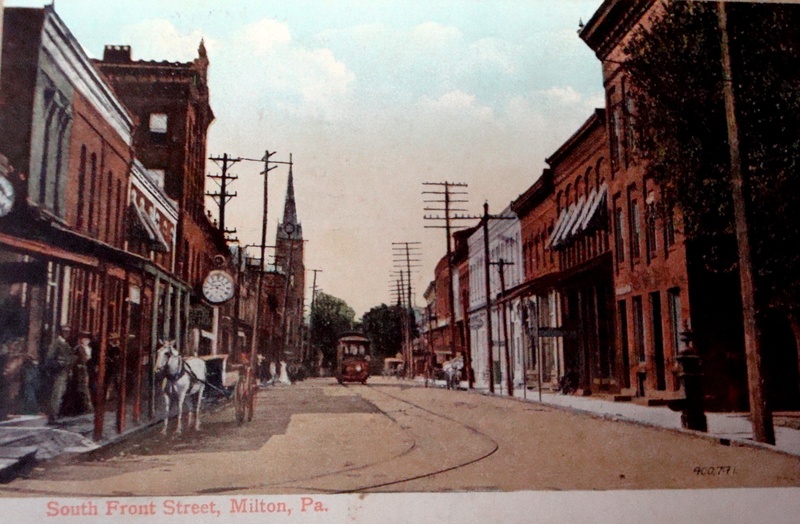 I love the post card of Milton, it sure has not changed much has it! I’m often surprised how little the buildings have changed across the years in many of the towns in central Pennsylvania. In suburbia and urban areas, it seems like many commercial buildings are replaced every 25 years or so. That is why I like small towns – their characters never change.